Need a technology partner to provide comprehensive, 24/7 telecommunication services? Our experts have been supporting NYC businesses for decades. When businesses don’t have reliable telecommunication infrastructure, their VoIP and teleconferencing systems don’t work properly, they’re unable to access cloud applications and data, and productivity gets threatened. Despite the importance of reliable telecommunications, many SMBs have no plan to deal with telecom problems when they arise. Calling your carrier and wishing for the best — that’s not an effective plan. 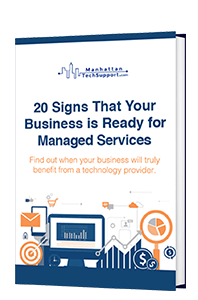 Manhattan Tech Support manages SMB telecom systems with the same expertise and diligence that it manages their network technology. Our telecom services provide businesses with a single partner to maintain all aspects of their telecommunications, from Internet connectivity and multi-site networking issues to VLAN trunking and VPN management. With a reputation throughout NYC for world-class, 24/7 support, our staff is always available to help you resolve your telecommunications issues and stay connected and productive. When your Internet connection is down, you call your telecom provider to get it fixed. If you get on the phone with support staff — and that might take a while — then you’ll likely have to prove that it’s not your own network that’s causing the problem. How do you do that? Diagnostics, analysis, and detailed explanations. With us it’s different. We’re a single point of contact for all your technology. Problems inside your office network? We can handle it. Problems between your office and the Internet? We can handle that too. Our team will address all your telecommunication issues no matter what. We can help you with every stage of your telecommunications strategy, from vetting carriers and solutions to the ongoing maintenance of your telecom infrastructure. We’re telecom experts who fully understand your IT requirements too. Align your network hardware with your telecom solution for optimal results. Scale your solution upward or downward with ease to meet your business requirements. No need to worry about outages or disruptions – we got it handled. In the era of cloud computing, fast and reliable connectivity has never been more important. 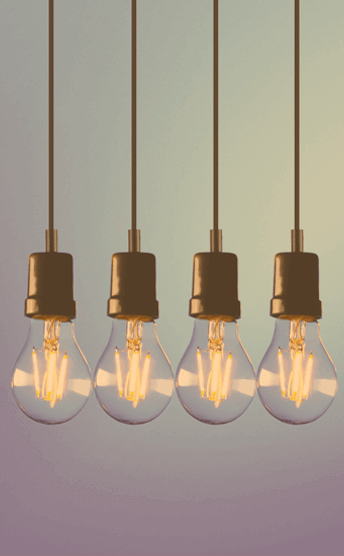 To make the most of your budget, we can help you integrate your telecommunications and cloud strategies into a single integrated plan, providing your business with a foundation for stronger resiliency, greater worker mobility, and the ability to innovate faster. Telecommunications are central to some of your most important business functions. Manhattan Tech Support will proactively monitor your telecom systems and go the extra mile to ensure optimal quality of service (QoS) for all your telecommunication-related applications. Integrating voice and data communications can supercharge your business, but only if your network is ready for the challenge. We know how to get your routers, firewalls, and servers to deliver worry-free integrated communications services, including VoIP and teleconferencing. 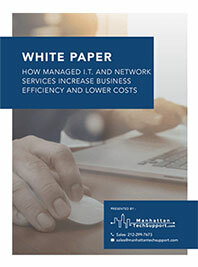 Services like disaster recovery and business continuity require fast, highly-reliable connectivity. We can combine our experience designing world-class disaster recovery solutions with our telecom expertise to create a solution that’s based on your unique compliance and security needs. Reliable telecommunications enable you to leverage platform as a service (PaaS) and infrastructure as a system (IaaS) applications, flexibly scaling your existing IT capabilities or adding new ones without the need for large capital expenditure. Need Telecommunications Expertise from a Trusted Partner? We’re always happy to answer questions and explain in greater depth how we can help businesses make the most of their technology. Contact us any time at 212-299-7673 or use the email form located on our contact page. We look forward to speaking with you! is our complimentary security audit for qualified organizations to assess their current security vulnerabilities and to provide recommendations to what can be done to safeguard their IT infrastructure. To get started, please complete the form below, and a representative will be in touch. Have you found that the needs of your company go beyond what prepackaged software vendors are currently offering? Exceed Digital, a division of ManhattanTechSupport.com, has a software development team that builds customized solutions around whatever productivity challenge you're facing, empowering you to eliminate even the most stubborn roadblocks to higher productivity.